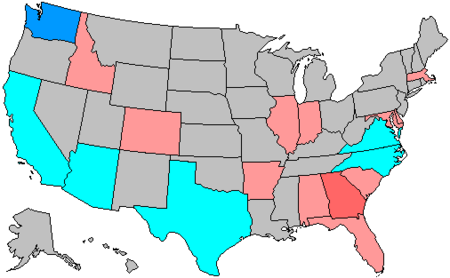 This election was the first using districts drawn on the basis of the 1990 Census. 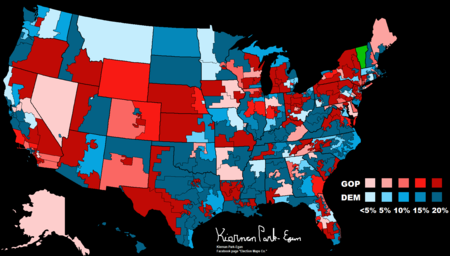 The redrawn districts were notable for the increase in majority-minority districts, drawn as mandated by the Voting Rights Act. The 1980 Census resulted in 17 majority-black districts and 10 majority-Hispanic districts, but 32 and 19 such districts, respectively, were drawn after 1990. 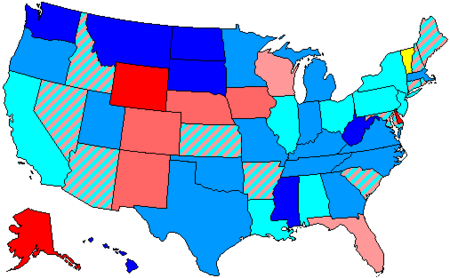 Among the Representatives first elected in 1992 were eight future Senators (Sherrod Brown, Maria Cantwell, Mike Crapo, Rod Grams, Tim Hutchinson, Blanche Lincoln, Bob Menendez, and Jim Talent) and three future Governors (Nathan Deal, Jay Inslee, and Ted Strickland). Also elected were future San Diego mayor Bob Filner, future Milwaukee mayor Tom Barrett, 2008 Green Party presidential nominee Cynthia McKinney, and the first Korean-American elected to Congress, Jay Kim. This page was last edited on 11 February 2019, at 16:45 (UTC).